During each of the preceding era’s in the industry (scribes pre-electronic, impact, page, service and commoditization era) the combined forces of social-economic change and technology innovation have combined to transform the industry. And in every era, a new set of players rises to the top and, in most cases, the incumbents fail to make the changes required to maintain their leadership position. Now we are well into the next industry era – the data era. And this has big implications for the industry. The first implication is for usage. For end users, the era of data means more and more of their communication and content will be digital, and never reach paper. Whether its for a transaction (when is the last time you sent a paper invoice? ), or communication (still printing out emails – probably not! ), or sharing your photo – increasingly this will happen electronically and paper will not be required. Now, this doesn’t mean paper goes away, paper will be with us for a long time. 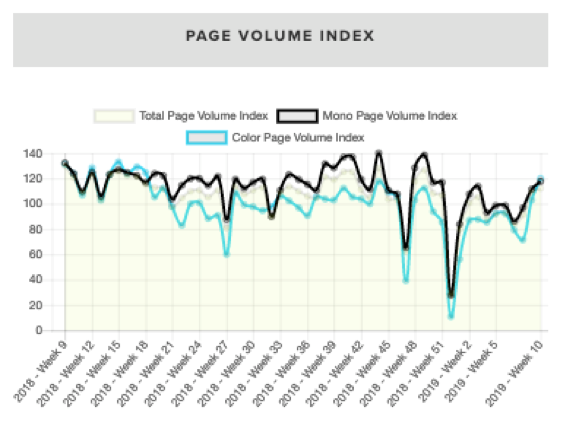 But it doesn mean page volumes are going to continue to decline as shown in our Page Volume Index (PVI) from the OFFICE JAVA market dashboard. The PVI monitors usage of over 20,000 devices and tracks indexes their daily page printing volumes relative to the second week of 2018. Clearly, declining page volumes have a ripple effect which means that the industry will be under increasing revenue and margin pressure as the sale of highly profitable supplies fall due to declines in printing. This is a really insidious trend because it isn’t always evident to the individual reseller or dealer. I spoke to one very successful dealer CEO who told me that their page volumes were up. I said fantastic. But when I asked why it was up, he said it was because they were winning more deals and adding more devices. I then asked the key question – did he know what was happening to page volumes on a per device basis? He had no idea. From his perspective, life was good. Supplies sales were up, because they had more contracts. But what happens long term? To keep revenue growing, he has to keep winning more accounts from someone else, and he has to win them at a faster rate than the page volumes are declining. This is a tough treadmill to be on. This leads to the second implication. Total revenues for the industry (office printing and imaging) will decline long term. So if the top line is declining, this means you have to work on costs. And this is the second aspect of the data era. We now have more data to manage the business than ever. And this data can drive long term, sustainable cost savings. Using predictive analytics, we can identify when devices are going to fail and fix them before they fail by analyzing metrics from the device. And more importantly, we can optimize routing of our service people to reduce the number of calls by fixing all the devices in a close proximity that will fail with one call versus multiple reactive calls based on device alerts. Additionally we can ensure we have all the parts required stocked on the van, and in the service depot so first time call effectiveness increases, while allowing the implementation of just-in-time parts inventory and logistics. We can also implement automated supplies replineshment systems using just-in-time supplies delivery which ensures the supply item arrives just before it runs empty – not early (which 90% of the time results in users replacing supply items early and wasting toner or ink left in the supplies), or late (which results in supplies running empty and customer dissatisfaction). SuppliesIQ is a predictive analytic tool we provide to fleet managers and infrastructure providers to provide the key data point for an accurate automated supplies replinehsment system - an accurate prediction of when the toner will be empty. Don’t think you have a problem with your supplies management system? Try our supplies calculator to find out how much you may save by implementing this type of approach. The calculator is free and is located here. And fleet management becomes ‘real’ fleet management with the active use of device data. By closely monitering customer usage patterns and device usage, you can optimize fleet deployment and make sure assets are being used in the most effective, and profitable manner possible. Furthermore, with the growth of seat based billing models (which I believe will be the dominant model in the future) using data to actively manage assets, optimize deployments, and to understand and predict customer behavior will be a key aspect to having a profitable seat based billing model (I will be posting another blog on this topic in the next few weeks). The new data era fleet manager and business executive will useactively data to manage their business and drive fundamental changes in the operations of the organization to achieve levels of efficiency and cost savings that would not have been possible ten years ago. This is where things really start to get interesting. In our upcoming webinar I will briefly review the history of the industry, where we are at now, and “what’s next” in the Data Era. So click here (LINK) to sign up for our webinar on March 28, 2019 and discover the three actions I recommend that you take to not just survive, but to thrive in the Data Era! And be sure and check out the new OFFICE JAVA Market Analytics Dashboard – it’s not a blog – it’s not news aggregation – it’s data combined with analyst insights! All for the price of a cup of JAVA! I encourage you to share your thoughts and opinions on the industry’s journey at on this blog, on the Virtulytix LinkedIn site or the LinkedIn discussion group at Imaging Industry Transformation.